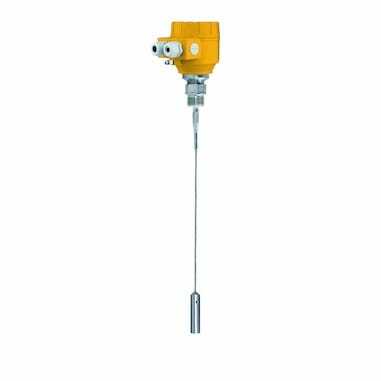 The 2291 Guided Wave Radar level transmitter is designed for continuous level measuring of conductive or non-conductive liquids, pulps and solids. The 2291 level gauge operates based on the well-known TDR (Time Domain Reflectometry) principle. Micropulses are sent along a probe guide at the speed of light. As soon as the impulse reaches the surface of the medium, it is reflected back to the electronic module. Level distance is directly proportional to the flight time of the impulse. The reflected signal is dependent on the dielectric constant of the material; the feasibility of the measurement is εr ≥ 1.9. The TDR technology is unaffected by the properties of the medium as well as that of the space above it. Measurement is also unaffected by the change in the physical properties of the materials such as temperature, pressure, dielectric constant. The +GF+ 2291 Guided Wave Radar level transmitter is designed for continuous level measuring of conductive or non-conductive liquids, pulps and solids.